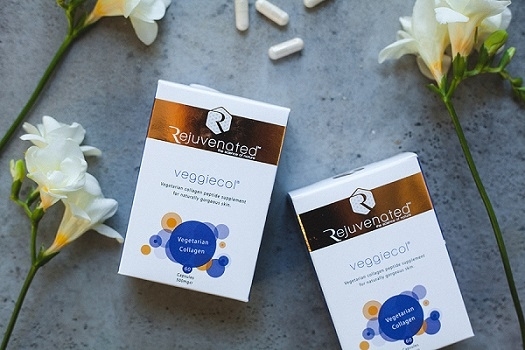 Veggiecol™ is the first natural collagen supplement to offer a vegetarian alternative to marine based Collagen Shots. After the age of 25 collagen synthesis reduces at a rate of 1.5% a year and the age of 45 collagen levels can have fallen by as much as 30%. The visible effects of this process are the appearance of wrinkles, fine lines & dry skin. Hydroxyproline : The key amino acid in the stimulation of fibroblasts which in turn stimulate the production of collagen. Glucosamine, keratin and lysozyme: Protect cells from oxidative stress and boost the immune system. Inhibits the production of tyrosinase, reducing the production of melanin and hyperpigmentation. Vitamin C: Contributes to normal collagen formation for the function of skin, cartilage & blood vessels. Riboflavin, Niacin, Vitamin C & Zinc: Contributes to the maintenance of healthy skin. Acai berry: A super berry fruit packed with amino acids, antioxidants, minerals & vitamins. Free from Gluten, lactose, sugar and artificial preservatives. If you are breastfeeding or taking any medications, please consult a doctor before use. "From the producers of a marine-based collagen supplement comes their veggie version, which whisks up proteins, amino acids, vitamins and minerals to protect skin from ageing." Cosmopolitan "The results on my skin, hair and nails have been amazing - my skin is looking more radiant and plump, which seems to have helped those horrid fine lines."